Description: The word Avinashi means that which is indestructible. This is one of the 7 Shivastalams in Kongu Nadu; however this temple is better known as Karunaiyaaththaal temple. Avinashi is also referred to in inscriptions as Dakshina Varanasi, Tiruppukkozhiyur etc. Tirumular's Tirumantiram, Arunagirinathar's Tiruppugazh & Manikkavacakar's Tiruvacakam refer to this shrine. This temple is regarded as the 1st of the 7 Tevara Stalams in the Kongu Region of Tamilnadu. History: Inscriptions here reveal that the Cholas, Pandyas and the Hoysalas have made extensive endowments to the temples.Sundaramoorthy Nayanar on his way to Tiruvanchikulam is said to have miraculously rescued a boy from the clutches of a crocodile, in Tamaraikkulam here & this event is commemorated during the 'Mudalai Vaai Pillai' Utsavam on Panguni Uththiram. 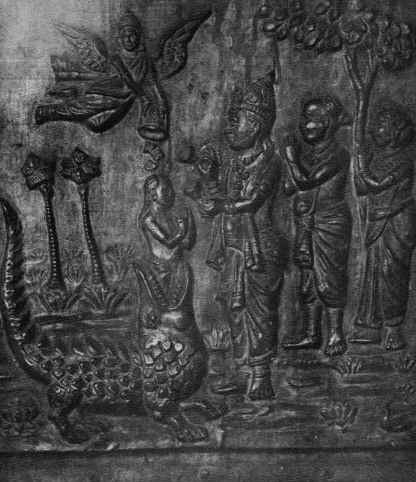 (The image shown above is a that of a panel in the temple illustrating this incident). There is a shrine to Sundarar on the shore of the Tamaraikkulam. The Temple: .Ambal's sanctum is to the right of Avinasiappar's sanctum, unlike that in most templesThe Kasi Gangai Theertham - in the form of a well is considered to be of significance. The Kaalabhairavar shrine in this temple is held in reverence. Kaala Bhairavar is worshipped here with offerings of Vadai Maalai. Architecture: This temple with 2 prakarams is adorned with the Navaranga Mandapam in the inner prakaram. The mandapam in front of Ambal's sanctum has interesting sculptural work. The large nandi here, and the carved image of a scorpion in the Ambal sanctum are of significance here. Several other carvings here deserve attention.Avinashiappar temple is a protected monument under the Archeological survey of India. Festivals: The annual Bhrammotsavam is celebrated in the month of Chittirai.The festival chariot here is said to be on par with Tiruvarur.